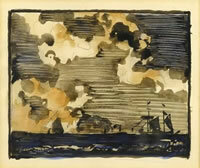 Painter of landscapes and coastal scenes in watercolour. Born in Angus, he studied art at Dundee, Edinburgh, and Herkomer's School at Bushley. Much influenced by the work of arthur Melville and also Japanese art. Lived for ten years in London but in 1901 made his home in Arbroath where he later died.